Tropical Fish Cellophane Roll 24 inches wide x 50 ft long. 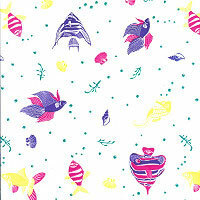 Angel fish, Betas and others in bright colors of purple, hot pink, yellow and turquoise. Cello background is clear. Perfect for wrappong gift baskets, presents, boxes, use it as a disposable table runner and much more.